Aplastic anemia is a serious blood disorder and describes what is anemia. In this case bone marrow of body is usually unable to make sufficient amount of red blood cells. Bone marrow is basically a tissue which resembles sponge responsible for making the stem cells that forms red blood cells, platelets and the white blood cells. Aplastic anemia is a specific type of anemia, in which red blood cells count becomes less. Anemia also occurs if there is not enough hemoglobin in the body. Aplastic anemia is a serious but rare form of anemia, which can get worse if treatment is not given at proper time. 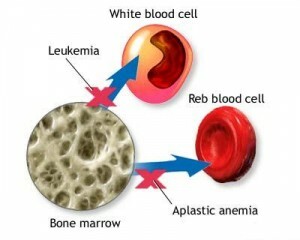 Aplastic anemia is sometimes also referred to as bone marrow failure in which body is unable to make platelets, white blood cells and red blood cells. Aplastic anemia treatment includes medicines, blood transfusions and transplants of bone and marrow stem cells. Treatment of aplastic anemia is same as sickle cell anemia treatment. Survival rate of aplastic anemia is less.